Dr. Michele Koons is a Curator of Archaeology at the Denver Museum of Nature and Science. She was awarded her B.A. in Anthropology from the University of Pittsburgh, her M.A. in Anthropology from the University of Denver, and her Ph.D. in Anthropology from Harvard University. Afterwards, Michele worked as a Post-doctoral Research Fellow in Anthropology at the Denver Museum of Nature and Science before accepting her current position as curator there. Michele joined us for an interview to talk about some of her experiences in life and science. When Michele’s not at work, she spends her time hanging out with her husband and one year old son. Some of her favorite activities include skiing, snowshoeing, hiking, cooking dinner with friends, and playing games like Trivial Pursuit and Settlers of Catan. As an archaeologist, Michele’s research involves studying people from the past using all of the clues they left behind. It’s like putting together a big puzzle to understand what people in previous civilizations did and how they did it. The ideas of discovery and exploration captivated Michele from an early age. She grew up in Philadelphia, but she spent each summer with her family on the Jersey shore. Michele’s favorite beach activities were looking for creatures on rocks, digging in the sand, and burying and excavating her toys. She also loved hearing stories from her uncle about the Roman artifacts they found when he lived in England. Michele was fascinated by archaeology, but people kept encouraging her to pursue other careers. In college, Michele initially majored in physical therapy, but she eventually found her way back to archaeology. After a volunteer outreach program to Bolivia in her freshman year, Michele changed her major to Latin American studies and anthropology. She later participated in an archaeology field school in Chile as part of a study abroad program. The leader of the program happened to be an archaeologist and got Michele involved with an archaeology project there. After finishing college, Michele wasn’t sure what to do next. She worked as a ski instructor, waitress, and dishwasher, while also volunteering at museums, before landing her first job as a seasonal worker in cultural resource management in Wyoming. After this job, Michele decided to go to graduate school to pursue her dream career in archaeology. Finding a permanent job was one of the most difficult and challenging times for Michele since the job market in archaeology was particularly bleak when she finished her PhD. Another ongoing challenge is the constant rejection scientists face. Many of Michele’s papers and grants have been rejected, and this is really frustrating when you worked hard on them and you really need to be successful to continue projects that you think are important. It helps for her to put these papers and grants away after they are rejected, and then come back to them later. Michele’s dissertation research was also tough. She worked on the north coast of Peru for about a year, and though the research was fascinating, it was a difficult place to be. They were tackling a big project, the area was hard to live in, she stood out from the local people because of her appearance, the region was becoming more dangerous, and it was challenging to maintain her personal life because she was spending so much time traveling for her work. So far, this year has been great for grants for their team at the Denver Museum of Nature and Science. They got a large grant from the National Endowment for the Humanities to support moving their entire archaeology collection to a new facility that was built about four years ago. Fifty volunteers have been slowly making progress on this project, but the grant will speed up the painstakingly slow process of moving every piece in the collection. In addition to having more space to store the collections, Michele is excited about all of the new discoveries they will make as they continue to review their collections and understand them better. 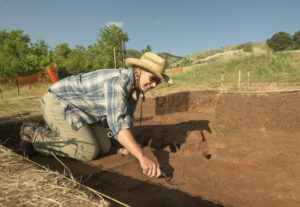 The second grant success this year will allow Michele to continue the community archaeology program they are working on in nearby Golden, Colorado. This project brought in over 1,000 people from the community to see a site called Magic Mountain where a hunter-gatherer campsite was established at least seven thousand years ago. Their excavations started there last year, and there have been many interesting discoveries. The community involvement is an important and rewarding piece of the project. Members of the public and different youth organizations walked through the site on guided tours, learned about the people who once lived there, and had an opportunity to help dig to find artifacts. Michele is excited to return to Magic Mountain this summer. Michele has spent a lot of time in South America for her work, including many trips to Peru, Bolivia, and Chile. She really enjoyed these travel opportunities, and they have had a big impact on her life. Another place Michele has traveled that left a lasting impact was the Chengdu region of China. This was a completely different place and culture than any she visited previously. Michele and her colleagues traveled there to conduct a survey in an area with traditional villages that were being torn down to build commercial buildings. It was sad to walk through the ruins of these old village, but they also stumbled upon some strange sights that to this day, Michele still cannot explain. These included an entire field of colored toilets and a separate field that was full of helmets. While doing field surveys in Peru, Michele and her colleagues got their old Chevy truck stuck in sand in the desert. She and one of her colleagues made the long trek to the nearest town for help, leaving one person behind with the truck. Sugar cane is a big part of the economy in this part of Peru, and all of the able-bodied adults were out working the fields and weren’t able to help. They managed to recruit about a dozen young boys and a man with one leg riding a bicycle to come to their rescue. All the kids jumped on to the bicycle and rode out with them to where the truck was stranded. The colleague they left behind was shocked at the spectacle of them arriving to the scene. However, they did eventually succeeded in pushing the truck out of the sand. As a reward, Michele and her colleagues went into town and bought their rescuers soda and cookies before heading back to meet with the rest of their research team. It’s not about time management, it’s about guilt management. It’s important to learn how to manage that guilt, how to avoid procrastination, and how to let things go that aren’t important. Though it is difficult to get a job and be successful in the sciences, it is possible. You have to have grit, be perseverant, and be able to think in many different ways. Keep in mind that your path and the position you find might not be perfect, and luck will likely play a role. Michele studies ancient complex societies, and she is especially interested in ancient political dynamics, social networks, and how people of the past interacted with their environment. In her research, Michele uses a variety of geophysical methods and remote sensing tools, as well as traditional archaeological techniques like excavation and pedestrian survey. Michele also specializes in ceramic analysis and radiocarbon dating. She has conducted archaeological research throughout the United States, Peru, Bolivia, Chile and China. Michele curates the archaeological collections from Latin American, North America, and Egypt at the Denver Museum of Nature and Science.